BLUE BIRD BAT HOUSE: This unique design combines a blue bird house and a bat house together as one. 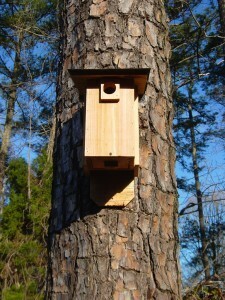 It is essentially a really deep blue bird house which has the extra back configured to serve bats. Blue birds have special requirements when designing a house for them and this one spares no detail. All the important features are built into their section so they will readily nest and use it from year to year. Bats demand roosting chambers, darkness during the day and warmth. This house provides ample space and sturdiness so that bats will find it comfortable and cozy. The shingled roof insures dry nests and roosting areas as well as shade and comfort. An added feature is that it actually looks great! This one-of-a-kind design stands 17" tall, 9" deep and 7" wide. 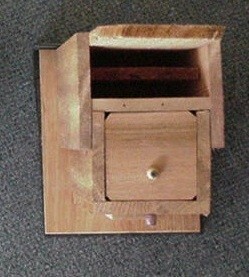 The front has a reinforced entry hole to help keep unwanted animals from entering. The knob on the bottom part of the front connects to a wood dowel which slides into the drop down bottom. When pushed into the front of the house, this dowel keeps the bottom secure and stable. When you need to clean the house, simply pull the dowel out and pull on the knob which is located on the bottom of the bluebird section. This will then hinge out allowing for easy removal of anything unwanted. The left side of the photo is the house as it appears from the front; the right side of the photo shows the house as it appears from the bottom. The bottom angle clearly shows the two chambers in the rear of the house which are for the bats. They feature channeled grooves, proper width and landing pad. Though not visible from the angles above, this house has a roof which is constructed with real asphalt shingles. They insure temperature stability and protection from the elements – a much needed improvement over standard blue bird and bathouse design. 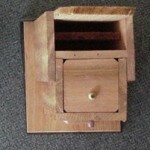 WHERE TO USE IT: This house needs to be placed where bluebirds will readily nest. Follow all the standard guidelines to make them happy including mounting it about 6 feet high, on a pole or a tree with no limbs and in a somewhat sunny open area. Bats will utilize a house regardless of height and though standard mounts have always been listed at 10 feet, they will readily roost in houses just a few feet up. The rule for mounting this house is simple: place it where blue birds are most likely to roost. Bats are known to take advantage of whatever they believe to be a good place to roost so don't worry about them finding it. If you place the house where blue birds like it bats will like it as well. The partition walls enable the two to live in the house at the same time without conflict and they will coexist happily.